Regular readers of this blog will know how indebted I am to photographer Percy Loomis Sperr, whose work I have drawn on many times as I've attempted to explore the local history of my neighborhood. Whether it's the end of the El on Fifth, Gowanus & Prospect Expressway construction, the florist and monument businesses surrounding Green-Wood cemetery, or the old nautical businesses down by the water, Sperr has proved an invaluable guide to the look of 30's & 40's Brooklyn. Some of the most interesting sets of Sperr's work are the Depression era photographs he took of squatter camps in New York City. From the Bronx to South Brooklyn, from Union Turnpike to Hester Street, Sperr provides important documentation of families struggling to survive at the edges of the city. 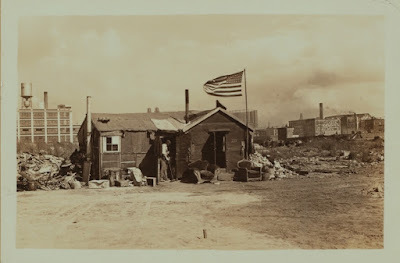 Many, but not all of the camps existed at the marshy edges of the city's waterfront, and some shared the footprint of the nineteenth-century shanty towns that preceded (and for a while co-existed with) the building of tenement housing. Between 1932 and 1935 Sperr took pictures of two local shanty communities in Red Hook, one settled around the waterfront area of Columbia Street, and surrounding streets (Van Dyke, Otsego, Beard), and the other he describes as the Gowanus Canal Colony, farther north-east towards Hamilton Avenue. This low-lying area of Brooklyn had an extensive network of shanty communities in the nineteenth century. These included Red Hook Point (around Van Brunt) Slab City (with the municipalities of Cabbagetown & The Village), from 4th to 6th Streets & Smith & the Canal, Texas - near the Hamilton Avenue Bridge, Sandy Bank, and Slickville/Sleekeville. Most of these came into being in the mid-1800's. Contemporary accounts of the communities veer between the critical and a romantic admiration for the independent, bohemian life of the squatter. Health Commission reports document terrible living conditions, with sanitation lacking & disease rife, while others suggest conditions varying considerably, & some camps maintaining a good degree of order. Many residents of the shanty colonies owned plots or paid rent, though others settled more tenuously. An Eagle article from 1889 telling the history of Slab City is cordial in its tone towards the place. Slab City acquired its name, apparently, because the founder of the settlement, Harry Smedley, built housing with slab boards acquired at the sawmill near the 9th Street bridge, and other early settlers constructed their homes with the same materials. The second settler in the colony is recorded as second-hand book-dealer Michael Cronin, who "pitched upon the Gowanus district as being a place where one might meditate and commune with nature, free from all fear of interruption." By the end of the 1800's, as Brooklyn merged into New York City, many of these communities were beginning to disappear. 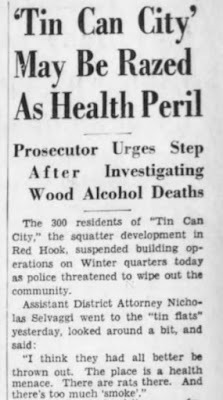 Pressure came from the City's Health Department, though as Robert Neuwirth suggests, a behind-the-scenes push from Tammany Hall may have influenced that sanitary zeal. Certainly those marshy waterfront areas were increasing in value. It's hard to find precise dates by which the squatter camps disappeared. Perhaps many of them simply decreased in numbers, and remnants remained. In 1892 the Eagle describes Slab City as "fading away," but an Eagle feature of 1900, entitled "Life Among the Squatters," suggests at least two hundred shanties right at the Columbia Street location Sperr photographed thirty years later. At least in some areas there appears to have been a continuity between the original squatters and their Hooverville successors. Sperr's photographs of the Red Hook Colonies present a varied picture of housing & residents alike . Some of the buildings look almost suburban, with well-gardens & front porches, while others are constructed in far more piecemeal fashion. Some are made of tin cans, others have a track or a wagon as a base. Some are in good repair and others barely stay vertical. Pictures show inhabitants gathering wood from the ruins of razed shacks. Certain streets have an ordered neatness, but scenes also show sad vistas of destruction. In one image a neatly suited & behatted man sits & gazes at the camera with a hint of recrimination, while in others more modestly attired men toil at household tasks. Residents are mostly white, though some black settlers can be seen too. You can make out local landmarks in the background of many of the photographs; the newly built Culver Viaduct, the Bowne Grain Storehouse, the 12th Street gas tanks, and the warehouse buildings at Clinton & Lorraine. Red Hook residents will recognize other familiar features. It's hard to tell from the pictures whether camp dereliction seen in some of the photographs is a result of outside pressures to close them down, or internal accidents and disputes. I suspect the former. 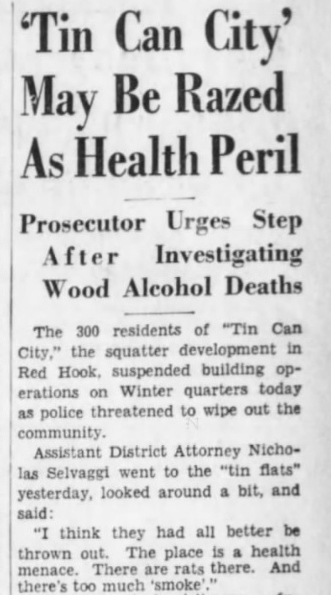 In 1932 the Assistant District Attorney Nicholas Selvaggi, investigating deaths by wood alcohol poisonings, urged that Tin Can City, situated at the foot of Court & Henry, be closed down, An Eagle story mentions longtime resident Squire McGuire, reported to have lived in a houseboat at the site since 1880 as the effective leader of the community. A terse quote from McGuire reflects the hardship of the times. "One thing about this dump," he says, "you don't find any old shoes or clothing lying around. They're all being worn." "Out of work for three years now, Milton tries now and then to stir up a crowd blowing around Borough Hall. But the wind isn't so effective outside, and once a cop threatened to take him in as a drunk. That put a damper on the whole business. Through the years the artist has added numerous features to his repertoire. Now, for instance, he can stage a summer thunderstorm, from the first rumble to the dramatic climax when the house is hit. He's good at imitating the sound of rain on a roof too. And he can even do the almost silent patter that comes with heavy snowfall." Unemployed shack dwellers, near Columbia Street, Brooklyn. C. Corbett at left"Captain". 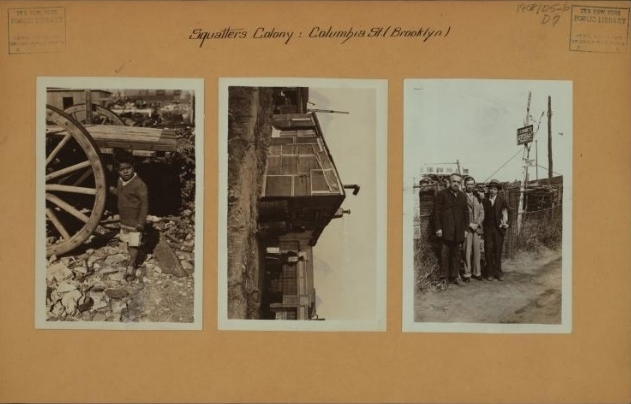 (a 2nd mate) Johnson at right (right); Another scene in the same section (center); A younger resident of the squatters shack colony, near Columbia Street Brooklyn (left). October 4, 1933. 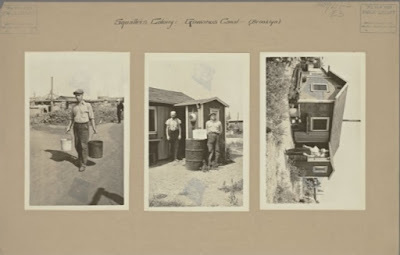 Ben Schwusky, standing behind his shack in the Gowanus Squatters Colony, Brooklyn (left); The same, another view (center); Another dweller, Adolph Werner, of the same colony (right). August 31, 1934. Salvaging wood from razed shacks, Henry Street, Gowanus shack Colony, Brooklyn. August 31, 1934. 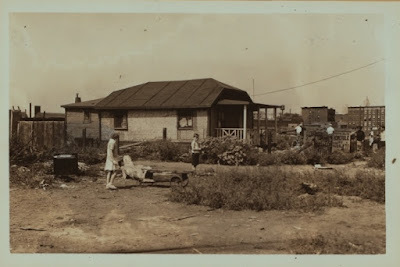 More of Sperr's photos of the 1930's squatter colonies can be found in the NYPL Digital Collections.